Just while I'm here - does anyone have instructions/ plans on how to build the type of bass traps I've described above? I can find a lot of videos online about building 'superchunk' style bass traps but none for the particular corner bass traps I'm building. I'm not much of a handyman so need all the guidance I can get! Lily is beautiful. Give her a big kiss from me. What specifically do you need help with? 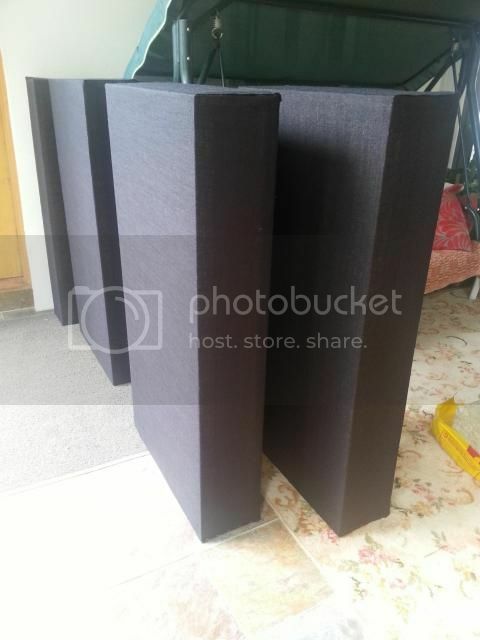 Bass traps can be as simple as rigid insulation stuffed into a plastic bag stacked near the corners, or as fancy as a wooden frame with attractive fabric stretched tightly and stapled, with the staples covered with thin wood strips. I guess my main query is about how to build the frames for the traps. I was planning on making basic frames that correlate to the size of the fibreglass panels, so 1200mm x 600mm x 200mm. I was then going to staple burlap around them to keep the fibreglass in place, and then stack one trap on top of the other in the room corners (so that they can still be moved around later if needed). -Should I build a frame that covers the entire sides of the fibreglass like this or try to leave the sides exposed like this? -Do I need to build some sort of feet for the frames so that they don't fall over when stacked on top of one another? Or should I be looking to fix them to the wall permanently? -At 60kg/m3, is the fibreglass rigid enough to stand up on its own inside the trap, or do I need to use some sort of chicken wire to keep it from collapsing internally? 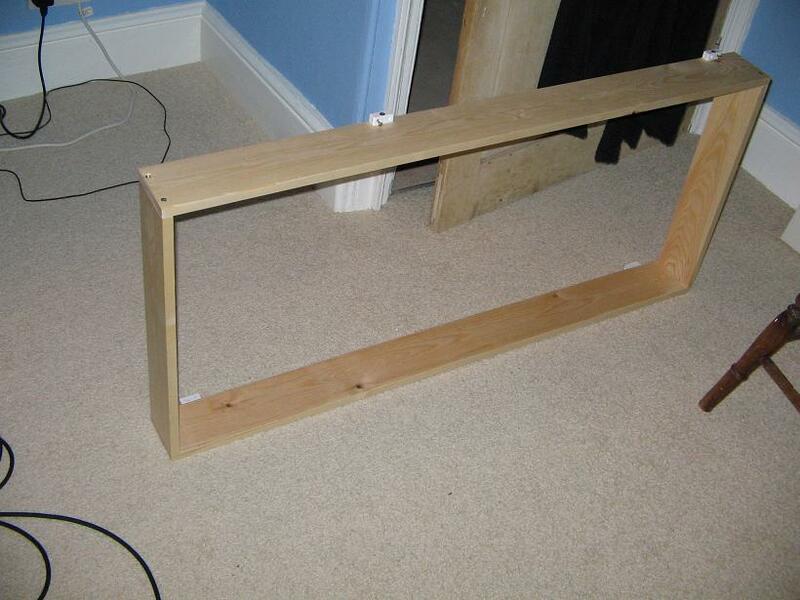 -Is building an outer frame enough? Or do I need some sort of support in the middle of the trap like this? Would a beam in the middle of the trap like this reduce the trap's effectiveness? Also, the door to the room I'm treating is in one of the corners. (Kind of like the white door in this picture.) Am I better off leaving the door open when mixing and placing that corner bass trap elsewhere, or shutting the door and placing the bass trap in the corner behind the door? I guess later on I'll have some questions about how to hang the other panels from the walls and from the ceiling to wall corners. Exposed sides add a lot more surface area. For 4-inch thick panels it's 50 percent more surface! So there's your answer. I don't have good answers for your other questions. I've done very little with rock wool and I don't know how stable / sturdy it is. If you need to support it, you'll know when you get the material. An open door is a good bass trap. But it depends on what's beyond the door. Measuring with room software will tell you which is better. So, I've finally started building these things. All of the frames are now finished, and I'm just waiting for the insulation store to reopen on the 12th of Jan so I can buy the rockwool. For the bass traps, I built frames that leave the sides of the rockwool exposed as well (for additional absorption). Should I cover the sides with the paper facing too? I just re-read your last post, specifically the "I've done very little with rock wool" part, and have just realised that rockwool and rigid fibreglass are different things.. I thought they were different names for the same product. I'm just looking into the differences between rockwool & rigid fibreglass, and a couple of comments on other forums have me a tad concerned, namely in this thread. Bryan from gik acoustics says that rockwool is 'not fun' to work with for main reflection points, particularly on the ceiling, and you comment that rockwool has a tendency to sag and get lumpy over time. 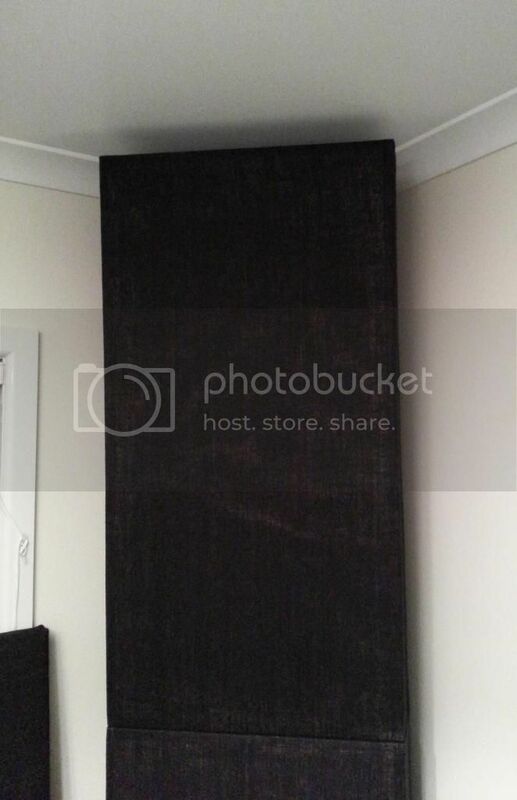 I have made first reflection point panels in full size panels (600x1200) from both 100mm thick and 50mm thick - 60kg. Both look identical from the day they were made. some are 5 years old. Both covered in plain muslin. I would make the same again without a worry. The ceiling would be most likely to sag - again, an entire ceiling has not moved at all. As there are now three full ceilings done in this manner - one of which is also 5 years old, I am happy to do the same again. One of those ceilings contains 250+ panels. I have used both Knauf and Rockwool trade names in these. I have also used rockwool (Thermafiber Safing 2'x4' 4" thick) for bass traps and early reflections. It's fairly rigid and holds it's shape but does shed small pieces and granular, sandlike "dust" when handled or cut (cut with a fine tooth hand saw if needed). I wrapped the panels with cheap landscape fabric and it effectively contains any loose bits, of which there is actually a very small amount. Wear gloves, long sleeves and face mask when handling. The material is not toxic but does cause discomfort. I did not mount or hang any panels from the ceiling so I don't know if the panels will sag as they might. If they do sag, I imagine it would be only slightly. To prevent sag, you might consider some kind of reinforcement like wood or thin metal battens. But as Steve points out above, he has seen no such problems. Should I cover the sides with the paper facing too? It looks like Steve has you covered on the rest. Thanks for the advice all! Will be ordering the panels today. So, I've got two panels completed so far for the main reflection points. Still have 2 more to go, plus the 6 bass traps. Will hopefully finish them tomorrow. Just a question about the placement of the panels for the main reflection points - should the panels be positioned vertically or horizontally on the wall? I thought that horizontally would make more sense, as I move back and forward in my chair more than I do up or down. I figure that the ceiling panel should be horizontal (parallel to the two speakers) and that the back panel should probably also be horizontal. That being said I've always noticed that people put the side panels vertically. Is either positioning ok? Yes, I think you're right about the side panels horizontal since your head height from the floor/ceiling will be fairly constant. The ceiling panels would ideally be in line length wise from each speaker to your head. That would put them on a diagonal. You could also cover the entire (or most of) area between both speakers and your head keeping the overall shape square or rectangular. If you do this, you will use more panels but in the process, have more bass trapping as a bonus. Side panels paced vertically on other wall areas are good for taming flutter echoes. Again if you place 2 panels together to form a square at your reflection point, you'll be that much better off. Thanks for the advice Rock! For a couple of the panels (I was particularly thinking of the one that will hang from the ceiling) I used some twine for extra support for the rockwool as below. Am I right in saying that this shouldn't affect the performance of the panels? Now all that's left to do is to hang/install them in the right places in my room. At the moment they're just sitting in the room as I haven't had time to hang them etc, but already the room sounds a lot better. Just a question regarding the bass traps - I'm aiming to cover each corner of the room from floor to ceiling by stacking two of the bass traps on top of one another. However the skirting board along the bottom of the wall means that there's a 2-3cm gap at each side of the bass traps (the traps aren't touching the walls). There's also a bit of a gap at the top of the traps, as the size of the wood + rockwool didn't exactly match the height of my room. The gap from the top of the bass traps to the ceiling is between 5-10cm. Yes, twine has no effect. I've never tested bass traps tight in a corner versus with a small gap. I doubt it makes much difference. The main thing is to get thick absorption in the general vicinity of a corner. I forgot to mention that it's not regular cotton twine - it's a plastic looking 'poly' twine - this stuff. Will it still have no effect? I've got a couple of ideas for fitting the traps into the corners a bit more snugly, as well as a way to get them closer to the ceiling. 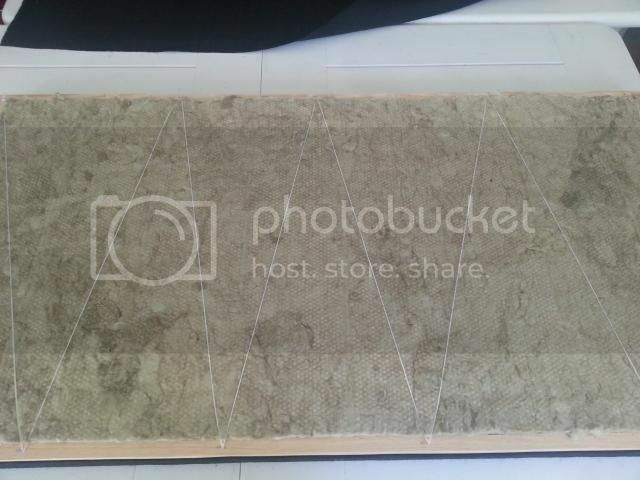 I'll post some photos when it's all set up! Not long until I start bugging you all about choosing studio monitors..
With acoustics, it's the big stuff that matters most. Twine? Not so much. I put off hanging up my panels at my main reflection points, as I realised that the height of the panels will need to be adjusted when I get new monitors so that the centre of the panels line up with the tweeters. If I was creative enough to mount the panels on adjustable stands the problem would go away, but for now there's no point putting extra holes in my walls. Is there a reliable method for choosing monitors? I've read countless reviews and watched videos on all kinds of monitors, but ultimately none give a reliable indication of the monitor's response. Most information out there is just people giving their opinions, or marketing hype. Finding reliable data on frequency response is also very difficult due to different averaging techniques the companies use to make the data look better. Going and listening to speakers in the store is also not ideal, as the speakers that sound the best aren't always going to be the flattest. I'm willing to save up and spend a fair bit on monitors to get the right results, but am also aware that at a certain price point I might be better off investing in more acoustic treatment, rather than getting more expensive monitors. Knowing where this price point lies however is difficult. Any advice on how I should go about this would be greatly appreciated. It certainly seems like a dark art. Monitor selection is a tough prospect! Not only is there insufficient data, too many "professional" loudspeakers add an intentional dip in the harshness range to sound more pleasing, which is just stupid for speakers meant to make mix decisions. How much are you looking to spend? And where do you live? Near a big retailer that will let you try a few models for a week each until you find a pair you like? I'm a fan of Mackie speakers because they're flatter than most and also have very low distortion. I've had ten years of experience with my HR624s, and even longer with friends who own HR824s. I know there are many other "good" brands and models, but I don't have experience with enough of them to be of much help. If you want to get into the tall grass of nearfield monitor design, check out the the link below which talks about why the Yamaha NS10 was so popular with mix engineers for many many years. Also, here is a link to a number of nearfield monitor test results by an academic expert in the field. That Resolution Magazine link is excellent. Thanks very much for posting it. Doubly problematical because the Resolution speaker tests are pretty good. The electronics reviews I checked, not at all. Pure subjective dirt! By being so blind to good popular studio monitors and other major product categories they have skipped over some of the widely used and best sounding products around. BTW the horizontal performance shown in the HR824 review is a master's class in how to design a speaker, but in the vertical direction it has been thoroughly eclipsed by the JBL Pro LSR 305/308 and the Behringer Truth. Thanks for the links! Very helpful. Would have loved to have seen the Yamaha HS8 included. People seem to really like them, despite many saying they are 'nowhere near' good enough to master on. Difficult to know what to believe. It's also difficult to know how much to spend on monitors. If spending more definitely gets you a flatter response, then I guess I'd save up as much as I needed to. However it seems that this isn't always the case. Sources like the link above are rare, and don't cover a lot of the speakers I've been considering. Perhaps I need to restrict my options to the speakers covered in the link above, just so I have reliable data to base my decision on. I don't live particularly close to an audio retailer, but I guess I could ask around to see if any in my city would let me try monitors before buying. I don't particularly trust my ears in this regard though - as we've already said, the speakers that sound the most pleasing aren't necessarily the most accurate. Am I right in saying that at a certain price point my money would better spent on more bass trapping and acoustic treatment, rather than top of the line speakers? It's difficult to know what is an appropriate budget considering the acoustic treatment I currently have. Yes, there are a number of nearfield monitor candidates missing from the resolution tests. For instance, I would like to see the test results for the Event Opals. But the methodology used and test results reported are instructive. Philip Newell's book Recording Studio Design shows response and waterfall graphs for a large number of popular studio monitors. The problem with all such reports is they quickly become obsolete because so many new models are introduced all the time. Very much agree about the Event Opals. Would love to see those test results, as when I think about saving up for very good monitors, it's usually the Opals that I have in mind. I'll have to see if I can get my hands on Philip Newell's book. I'll warn you, Newell's book is excellent but it's very pricey. Did you try the library? Some networks can search the entire country. I've gotten books as far away as Alaska. Arnold, the Newell book referred to by Ethan above does contain test results for the JBL LSR 25 and 32 and the Behringer truth monitors. Those tests were conducted by Keith Holland who also did the tests posted at the resolution magazine website linked in my post above. Curiously, the book contains some test results not on the website and vice versa. It is remarkable how well the original Mackie HR824's perform relative to even much costlier monitors. Unfortunately, it appears that the Mk2 version of those don't have as flat a frequency response and have more low-frequency distortion, although whether that would be noticeable in actual use would remain to be seen. Libraries in my city don't appear to have that book unfortunately. I did find a frequency response graph for the Event Opals on their site here although I don't know how reliable it is. Am I right in saying that the displayed frequency response isn't overly impressive for a $3000 monitor anyway? When reading up on good monitors everyone is mentioning monitor controllers. Is it necessary to have a monitor controller? The list of things to buy seems never-ending..
Edit: To find the frequency response in the link above you'll need to click on 'specs' first.